Things are a little bit different on the Prima blog this month. Instead of having PPP, BAP and CAT, it's only one big challenge with a moodboard, mostly with pink colors, hints of shabby and touches of gold. As we are in February, and only few days from Valentine's day, I decided to create the perfect bottle for a love potion ! A lot of Prima products there ! I started with a small (empty) bottle of wine and some old book pages with gel medium. Gesso all over it, and then white crackle paste. Once dry, I apply pink chalk plus black gelato mixed with water to give the grey shadows. Some light brushes of gold crackle paste and crosses stamped with black distress ink and the bottle was ready to be decorated. 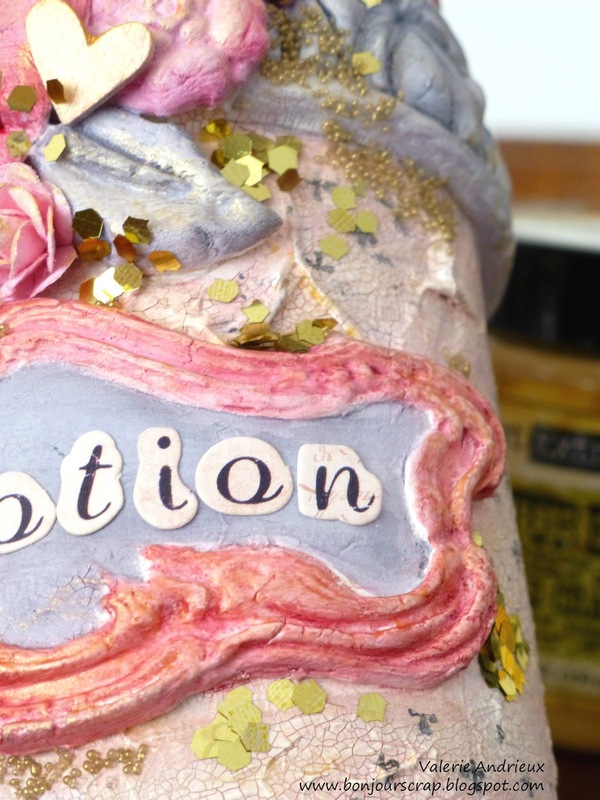 I created the clay embellishments with IOD molds, then painted them with Colorations sprays in Raider, Barbie and Valentine (Art Anthology) before adhering them with gel medium. 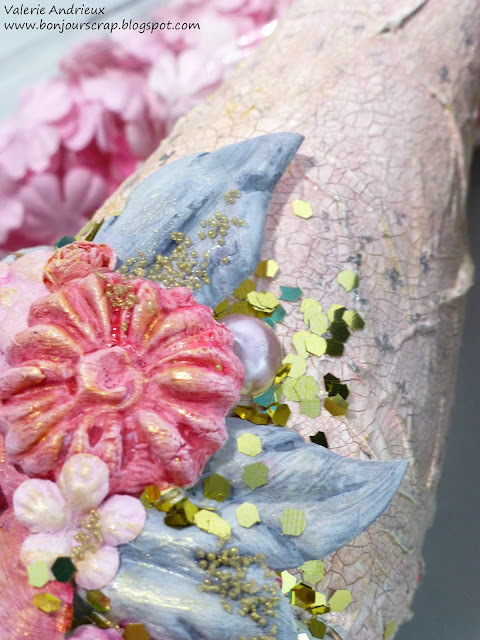 I added Prima flowers and few other embellishments and added light brushes of gold crackle paste before adhering gold flakes and gold microbeads with gel medium. Text created with alpha stickers from the Tales of You & Me 12x12 kit. Thank you for reading this post today, I hope you like what you saw... Let me know if you think this project has some chance to win this new challenge ! Beautiful!! Awesome colors and texture!! Thanks ! 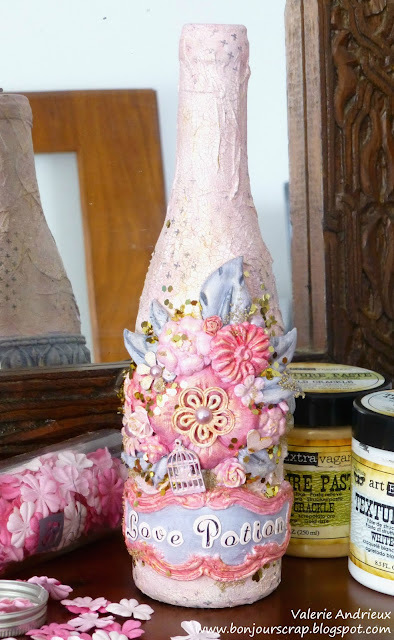 I have a tutorial on my YouTube channel for an altered bottle if you're interested... Check the link on the top of the left column.